Have you ever needed to memorize a phone number? IP address? Hex color code? I made just the thing for you! 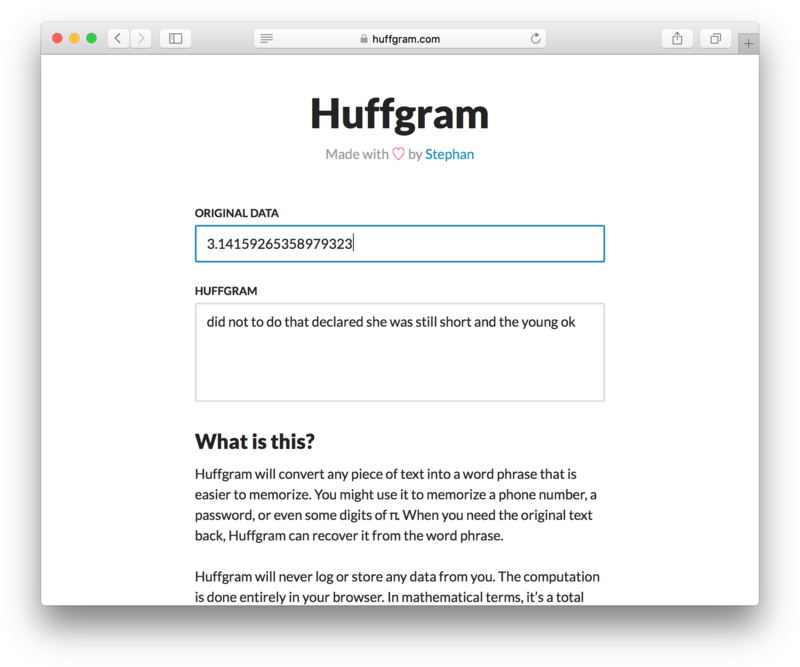 Huffgram will convert any piece of text into a word phrase that is easier to memorize. You might use it to memorize a phone number, a password, or even some digits of π. When you need the original text back, Huffgram can recover it from the word phrase. Using a corpus composed of a handful of modern classic novels (e.g., To Kill a Mockingbird), I constructed a bunch of Huffman trees. Each unique word in the corpus gets its own Huffman tree, which is generated from the probability distribution over subsequent words. Thus, the Huffman trees approximate a bigram model. All of those Huffman trees (~900kb of minified JSON) are loaded by the browser. You can download the file here. Essentially, Huffgram interprets the input as compressed data and decompresses it using those Huffman trees. For each word \(w\), Huffgram “decompresses” the next word by traversing the Huffman tree for \(w\) according to the next few bits in the input. To choose the initial word, there is a Huffman tree generated by the probability distribution over words that start sentences in the corpus. You might wonder what happens if, at the end of the input, there aren’t enough bits to reach the bottom of the last Huffman tree. We could try finishing the path in some arbitrary way (e.g., always go left) to get to a word, but then the mapping wouldn’t be invertible. So we might have some bits at the end which don’t complete a word. To resolve that, we have a special list of special end words, and we treat those final bits as an index into that list. I just released socket.js, a real-time communication framework for Node.js powered by WebSockets. It has no dependencies. Socket.js is lightweight. The minified client is under 5kb. Contrast this with socket.io, which is 95kb minified. But it’s not a fair comparison. Socket.js relies on WebSockets and does not include any fallback transport mechanisms. So only use it when you can assume WebSocket support in your audience’s browsers. Most modern browsers support WebSockets; check here for a compatibility chart. ...deliver messages out of order. ...deliver messages after the application thinks the socket has been closed. ...deliver queued up messages before the “reconnect” event is fired in the case of a temporary network failure. ...leak memory in the server or client. ...have undefined or insecure behavior if it receives a malformed or malicious message from a client. ...automatically reconnect if the connection is lost, unless it was intentionally closed by the application. ...validate inputs to all methods and fail fast. ...drop messages (and not resend them) if there is a network interruption. That last point may be surprising to you. If you want messages to be resent in the case of failure, you must build that functionality into your application. The server has no idea if or when the client will come back, so it would have to keep queued messages for some arbitrary TTL and then subsequently vacuum them if the client never reconnects. Then, if the client finally does connect after the queue has been deleted, those messages would be dropped anyway. Socket.js is honest about its behavior: it will start dropping messages immediately if there is a network interruption, and it will start sending new messages once the connection is reestablished. Socket.js was designed to support many simultaneous connections. If a connection is dropped, the server will not hold references to any queued messages or other data structures for that client. It is up to the client to provide any context needed by the server (e.g., a session ID for some session store) when reconnecting. socket.send(type, message) sends a message to the client. type is a string indicating the type of message. message is any value that can be converted to JSON. socket.receive(type, handler) registers a handler for a particular type of message. type is a string, and handler is a function which takes the message as an argument. If handler === null, any existing handler for this message type is removed. socket.close(handler) registers a callback to be invoked when the connection is closed, either intentionally or because of a network interruption. If handler === null, any existing handler for this event is removed. If handler is not provided (or handler === undefined), this method closes the socket. reconnectData is an optional value provided by the client when it reconnects in the case of a network interruption. If the client does not provide this value, it will be null. socketjs.isSupported() returns a boolean indicating whether the browser supports WebSockets. socketjs.connect(host, secure) returns an object representing the connection to the server. host is the name of the host and optionally the port, separated by a colon. secure is a boolean indicating whether to use the WS or the WSS protocol. If these parameters are missing, Socket.js will attempt to connect to the host that served the page, using the same port and security level. send(type, message) sends a message to the server. type is a string indicating the type of message. message is any value that can be converted to JSON. socket.disconnect(handler) registers a callback to be invoked when the network is interrupted. If handler === null, any existing handler for this event is removed. socket.reconnect(handler) registers a callback to be invoked when the connection is restored after a network interruption. The value returned by the callback will be sent to the server (see reconnectData above). If handler === null, any existing handler for this event is removed. socket.close(handler) registers a callback to be invoked when the connection is closed by either the server or the client. If handler === null, any existing handler for this event is removed. If handler is not provided (or handler === undefined), this method closes the socket. I recently refactored Netflix Party to use promises for asynchronous tasks. Conclusion: promises are pretty cool! Answer: A, C, then B. ...which prints B, then A. Although this isn’t any shorter than just using setTimeout(func, 1), it clarifies the intention and is composable with other promises. The fact that it can be chained with other promises leads to better structured code. Over the weekend I made Netflix Party, a Chrome extension to synchronize Netflix video playback on multiple computers. You know, for Netflix nights with that long-distance special someone. You can get it here from the Chrome Web Store. Figure 1: watching The Best Offer with Netflix Party. The basic architecture of Netflix Party is a client-server model. The clients connect to the server to synchronize their playback state. For the server, I wanted something low-latency that many clients could connect to at a time. Node.js fit the bill nicely. Sessions that have been idle for more than an hour are vacuumed. The server also renders a simple homepage at netflixparty.com, using my minimalistic templating engine for Node.js. The uiEventsHappening variable keeps track of how many simulated UI actions are in-flight. We don’t respond to user input unless uiEventsHappening === 0, to distinguish between simulated user actions and real user actions. That magical spell was obtained by lots of trial and error. But that’s not even the hackiest part. Jiggle the mouse so the playback controls appear. Wait 10ms for the UI to respond. 1ms is apparently not enough. Simulate the cursor hovering over the playback slider so the thumbnail preview appears, because apparently the playback slider doesn’t respond to input unless the preview is visible. Wait 10ms for the UI to respond. Click on the playback slider (called a “scrubber control” in the minified Netflix code) at the appropriate position to seek the video. Invoke the hideControls() magic from above. The above snippet is almost certainly the worst code I have ever written. Note the instrumentation. The roundTripTimeMedian variable stores an estimate for the round-trip delay time to the server. It is the median of the measurements from the last 10 Ajax requests. I chose a simple median filter because it is robust to outliers. The round-trip time is used to compensate for network latency (we simply divide it by 2 and assume the one-way latencies are symmetrical). The localTimeMinusServerTimeMedian variable estimates how the local time is different from the server time. Since it is measured, we don’t need to rely on accurate time zone information from the browser. Again, we take the median of the last 10 values to get a stable measurement. In the future, I might try a fancier clock synchronization protocol like NTP. But for now, the approximation is good enough. Whenever a user plays, pauses, or seeks the video, the event is sent to the server with a timestamp (lastKnownTimeUpdatedAt) in server time. The server only knows about its own clock. Each client is responsible for converting its own times into the reference frame of the server. Now, here’s the tricky part. Suppose the client receives some nominal playback position from the server. Seeking to that position, in general, takes nonzero time. Buffering can take several seconds. By the time you’ve jumped to that position, buffered, and started playing the video, the other clients are several seconds ahead! My solution is to jump a little bit ahead of the nominal time (2 seconds in this case), and pause the video there while buffering in the background. A timer is set to wait there until the other clients have caught up, and then resume playback—and hopefully buffering is complete by then. This has the added benefit of increasing the available temporal resolution. By just clicking on the scrubber, you get about 3-5 seconds of precision (a pixel covers about that much time depending on the window size and video length). But by jumping a little bit ahead and pausing for a moment to compensate, the resolution increases to a couple dozen milliseconds. This was a fun (and, at times, stressful) weekend project, but now I can organize remote Netflix parties. Happy New Year! 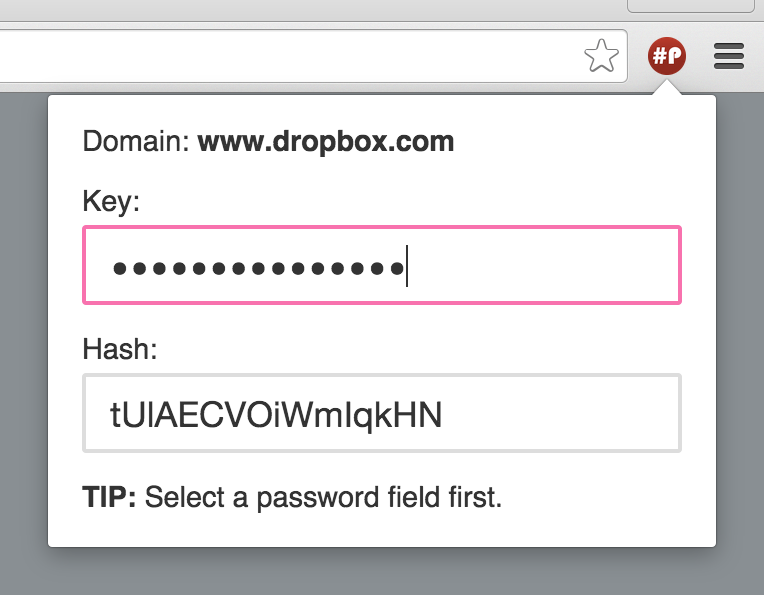 I just finished building Hashpass, a Chrome extension designed to make passwords less painful. It generates a unique password for every website you use, and you only have to memorize a single secret key. Hashpass is deterministic, meaning that it will always generate the same password for any given site and secret key. It uses a well-known formula to generate the passwords, so you could even compute them yourself. Hashpass never writes to the file system or makes network requests. There is no password database. Install Hashpass from the Chrome App Store (link). You will then see the Hashpass button next to your address bar. There is also a compatible Android app, courtesy of Erik Byström. It is available on the Google Play Store (link). The source is available here. Suppose your secret key is bananas, and you’re signing up for Facebook. Hashpass combines the current domain name and your secret key with a / as follows: www.facebook.com/bananas. It then computes the SHA-256 hash of that string. Then it hashes it again and again, 2^16 times in total. Finally, it outputs the first 96 bits of the result, encoded as 16 characters in Base64. In this example, the final output is sWwtmA9uA6X9SyXD. This result can be reproduced using the Python script near the bottom of this document. If an adversary has your secret key, they have access to all of your accounts. Hashpass never reveals your secret key. But we must make sure that an adversary can’t determine it from the generated passwords. SHA-256 is one of the most widely-used cryptographic hash functions, and is considered unbroken at the time of this writing. This means that given a hash of a long and random string, an adversary can’t recover that original string. However, secret keys produced by humans are not typically long, nor are they perfectly random. They often contain predictable words or phrases. One strategy for cracking your secret key is to try hashing all English words, for example. This is called a dictionary attack. An attacker might even try to pre-compute the hashes of all English words and other common passwords. Then they could simple look up hashes in this hash table to crack them. The table in this attack is called a rainbow table. A common defense against these attacks is to add random bits to your key. This is called a salt, and it ensures you don’t use the same key as anyone else. Most security software will automatically add a salt to your key and store it. Since Hashpass doesn’t store anything, it cannot add a salt for you. It is up to you to pick a key with enough entropy to defend against dictionary attacks. Longer is better. More random is better. Don’t use a single word. Definitely don’t use bananas. Hashpass doesn’t limit the size of your secret key—take advantage of this. A determined attacker might try all strings up to some length. This generally takes longer or requires more computational power, but it’s not impossible. For example, a reasonably-equipped hacker might be able to compute a trillion hashes per second. There are about 839 quadrillion 10-character alphanumeric keys. If keys are only hashed once, a hacker can crack a random 10-character alphanumeric key in a little over four days, on average. This is called a brute-force attack, and it relies on an attacker being able to compute a large number of hashes very quickly. To provide resistance against such attacks, Hashpass applies the hashing function many times (2^16 times, to be exact). This makes testing a key take much longer. On average, our hacker now takes more than 800 years to crack a random 10-character alphanumeric key. Even with 2^16 rounds of hashing, it takes our hacker only 30 seconds to crack a random 5-character alphanumeric key! It is strongly advised that you pick a key with at least 10 characters. With Hashpass, an adversary with one of your generated passwords can try to guess your secret key and gain access to all your accounts. With a traditional password manager, those with access to your password database can try to guess your master password. These are very different threat models, but it is not obvious which is better. For example, if no one has access to your password database, a traditional password manager provides the better security model. If you normally sync your password database to the cloud, you might instead chose the Hashpass model, especially if you don’t trust your cloud provider. A strong secret key is a solid defense in both models. Since Hashpass doesn’t store passwords in a database, you have no chance of accidentally deleting them, and you don’t need to sync them across multiple devices. You also don’t have to worry about me abandoning the project, or using a computer that doesn’t have Hashpass. Since Hashpass uses a well-known hash function rather than a proprietary password database, you can always compute the passwords yourself if Hashpass is unavailable. All of the information needed to produce your passwords is in your head. That property is what motivated the development of this project. If a generated password is ever compromised, you don’t need to memorize a whole new secret key and update all of your passwords. For that service only, just add an incrementing index to your secret key. Such a tiny change in your secret key results in a completely new password for that service. For example, if your key was bananas, just use bananas2. If you can’t remember which iteration of your secret key you used for a particular service, simply try them all in order. Some websites have certain requirements on passwords, e.g., at least one number and one capital letter. A simple way to meet such requirements is to append something like A9! to the generated password (and remember you did that). You don’t have to use the same key for every service. But the point of Hashpass is that you can, provided your key is strong enough.